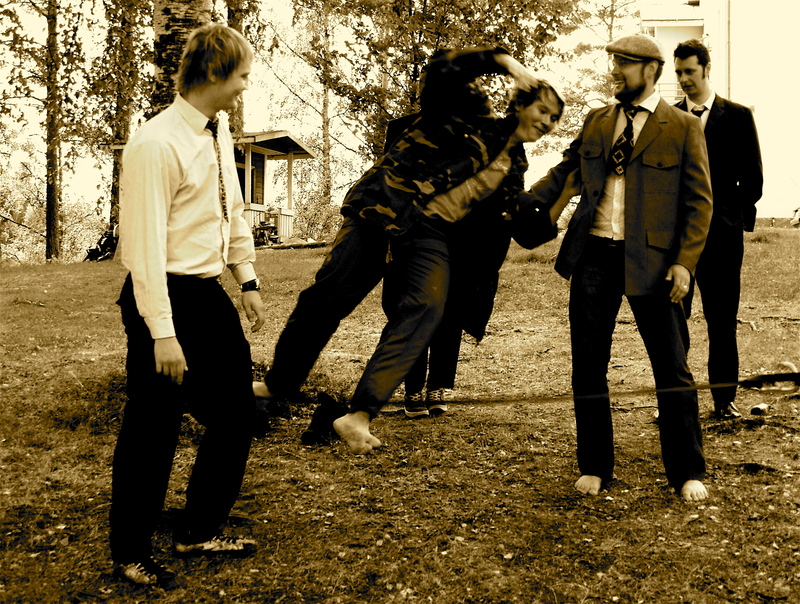 The history of slacklining can be a confusing topic because people often confuse it with the tightrope modality. For many centuries there has been rope walking, tightrope walking, and wire walking. When you hear someone mention tightrope, many of you may think of the circus, and it was indeed performed in the circus. However, the art of slacklining–balancing on a flat webbing, originated in the climbers world. As early as the 1960’s California climbers in the Yosemite Valley began balancing on chains in parking lots, on their climbing rope, even on steel cables. This rustic form of line walking is where it all began for the slackline community. The birth of current day slacklining is mostly attributed to Adam Grosowsky. This young climber had a passion for balance that spread like wildfire. 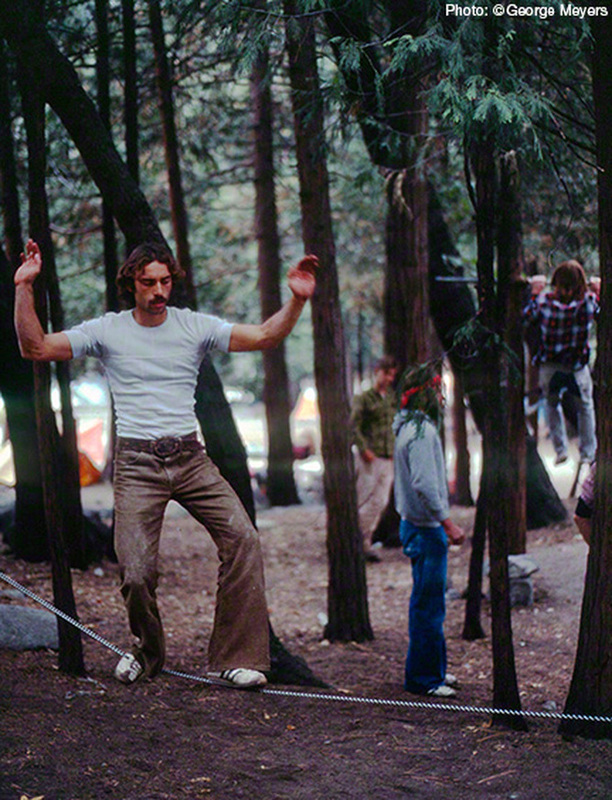 It was in the early 1980’s, when Adam Grosowsky and Jeff Ellington rigged a piece of tubular webbing, that slacklining was born. In the summer of 1983 Grosowsky and Ellington set up a 55′ long high wire at Yosemite’s Lost Arrow Spire. Neither of them successfully walked the line on this attempt, however their efforts inspired many. They in turn inspired Scott Balcom and Chris Carpenter to rig and walk The Arches in the autumn of 1983. It’s believed to be the first recorded highline walk on nylon webbing. (The Arches is a line rigged in Pasadena, California under the California SR 134 Freeway bridge.) On July 13, 1985 Balcom became the first to walk across Lost Arrow Spire, again on webbing, as opposed to wire. Through the 1990’s and early 2000’s slacklining spread across the world. Finding it’s way through Europe, Germany, Austria, Switzerland, Scandinavia, the U.S. and many other places. Between 2007 and 2015 many companies such as Gibbon, YogaSlackers, and Slackline Industries began creating and marketing slackline kits to the public. This helped make slacklining affordable and accessible for many people. Since 2015, even more slackline companies have emerged, continuing to spread the stoke. Over the years, many types of webbing have been created and each one offers its own unique walk. The webbings are made from different materials, with different weave patterns and stretch capabilities. The variety of accesible webbings and the expanding ability to create strong-tensioned long lines, has facilitated the steady growth of the global slacklining community. From this growth, many various styles of slackline practice have evolved. Styles ranging from tricklining,–which utilizes a 2” wide webbing, to slackyoga–which involves doing static yoga poses using a 1” wide webbing. Other styles include waterlining, longlining, acrolining, and of course highlining which has only continued to grow in popularity. Over the past 15 years, many athletes such as Dean Potter, Andy Lewis, Alexander Schulz, Nathan Paulin, Danny Menšík, Pablo Signoret, and Lucas Milliard have all helped to stoke the slackline fire around the world. So many other amazing people out there have also helped this sport evolve, much respect to all of you. It’s all of your efforts that have helped shape the sport into what it is today. New records are being set faster than ever before. Highlines over a mile long (5452′) have already been walked and tricklining competitions are continuously growing in skill and diversity. It’s hard to keep up with all the upcoming talent when kids as young as 10 and 11 are walking longlines 100′ and longer. Welcome to the world of slacklining where history is made everyday. What’s to come in slacklining’s future? That’s hard to say. Highlining is continuing to explode. Tricklining, waterlining, slackyoga and longlining are all blossoming into their own specialties. I think it’s a little to early to say what the limits of growth are for this sport. There are people doing handstands on highlines, people walking blind folded, doing back flips, fire dancing on firelines, and doing full yoga flows on slacklines. The possibilities are as endless as is the imagination. I just know I’m excited to see where we take this activity over the next 5 years…what limits are pushed, what records are broken, and how many activities we continue to blend with the art of slacklining. Have you been wanting to delve into the world of slacklining, but aren’t sure where to begin? Well, you’re in luck because we have put together a comprehensive beginners guide just for you! Learn about webbing, set up, slackining styles, and educational resources available to you as a beginner. The guide is 100% free, because we want this sport to be accessible to everyone. Read more about the Slackrobats eGuide, or download it instantly here.